Hey!! It’s fall yall! Dana and I are continuing with our Halloween Series!! I am bringing you guys another easy Halloween treat because I don’t know about you guys but I have like zero time lately and am in serious need of some quick treats. This is another one of my barks that I love to make. Bark is so easy and quick and you can change it 1000 ways, no 2 barks are ever the same lol! 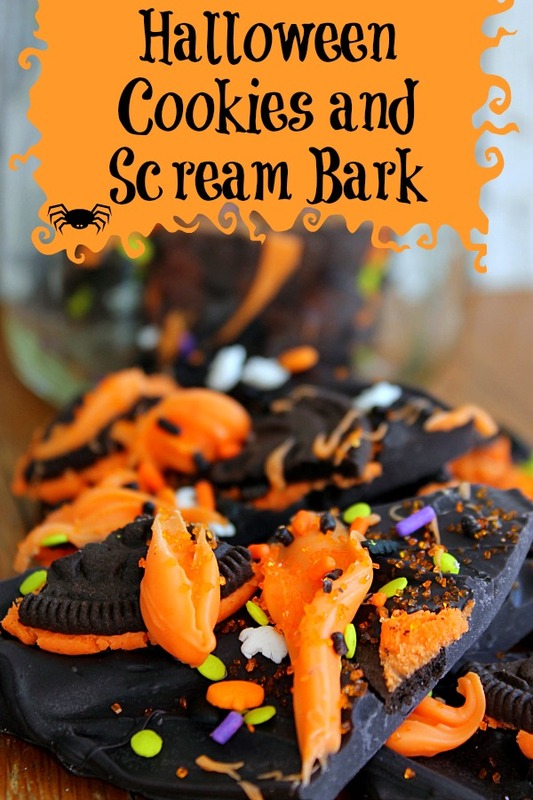 For this bark I was inspired by the Halloween Oreos and decided to throw them into some orange and black chocolate for the perfect Halloween Cookies and Scream Bark. This bark would be perfect to package up and give to your little ghouls and goblins. It also makes the perfect party favor for all those Halloween parties! Feel free to add in your favorite Halloween candies and make your own Cookies and Scream Bark! Melt the black chocolate in the microwave in 30 second intervals until melted and smooth. Pour the black chocolate into a foil lined 9x13 dish. Top with the broken Oreos. Melt the orange chocolate in the microwave in 30 second intervals until melted and smooth. 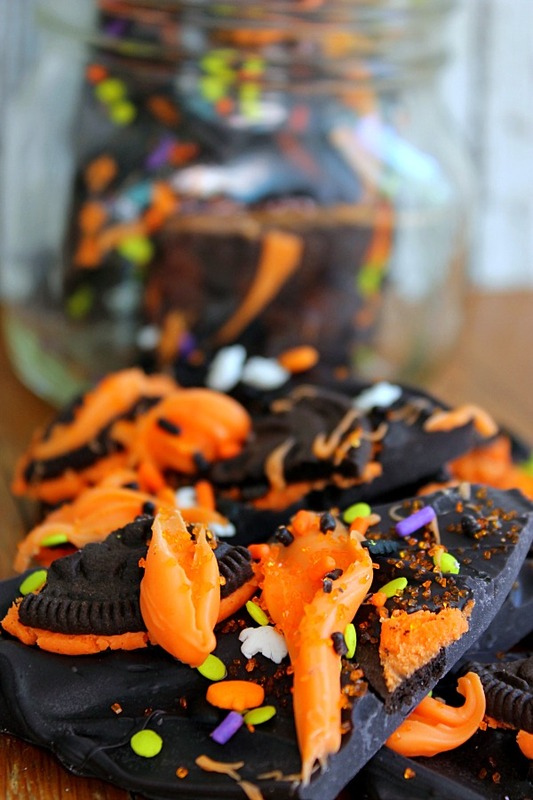 Drizzle the orange chocolate over the black and cookies. Sprinkle the whole thing with Halloween sprinkles. Don’t forget to go by Dana’s and check out her Pumpkin Oreos! Yum! oreos are a weakness of mine – i could munch them ALL day long :) nom nom nom! 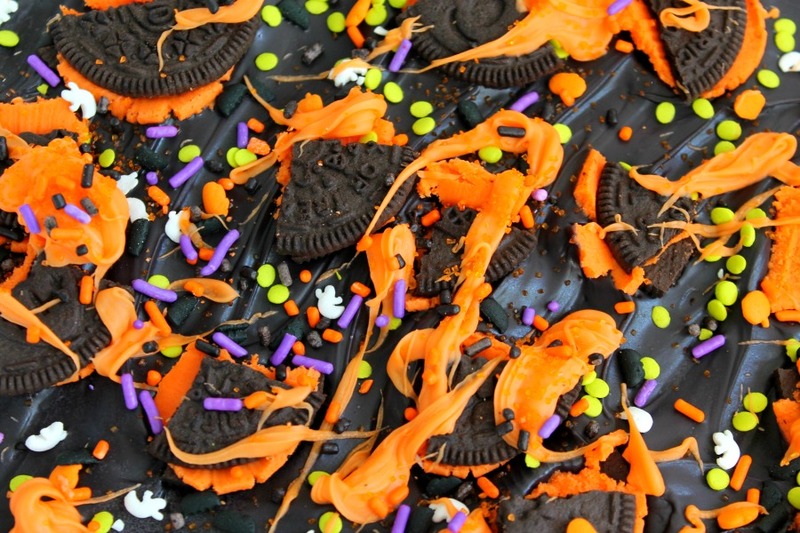 this halloween bark – cookies and scream – sounds, looks and I bet will be – delish! Thanks for sharing at Snickerdoodle Sunday! This is so cute! And looks so tasty! Thanks for sharing! Pinning! Stopping by from Hit me with your best shot link party. Love this bark! I was looking for something flat and colorful that wasn’t a cookie for my son’s class favors. Pinning and making! This is so fun, I love the bright colors and it would be perfect for a party treat! Love the name of your blog! Thanks so much for sharing with the Thursday Blog hop. Hope you will join us at http://www.over50feeling40.com. Have a great weekend! Love this! Will be making up a Halloween goodie box to send my son at college and this will be great. Featuring when my link party opens up tonight. These look so fun and festive. Thanks for sharing on Weekend Bites. They are this weeks feature! I love this! Just wondering what the ballpark time for hardening is? I haven’t ever made something so large out of chocolate melts and would like to make it this weekend for a party. Thanks! !